Suppose you want to give all the entrants of a particular event discounted entry to some other event? An obvious way to do it is to generate a voucher and send it out via email. But ideally, rather than send out one magic voucher code to everyone (which might get forwarded on to friends / posted on Twitter etc.) you would send each person a unique voucher code that only worked once. You could do that in the past by creating a new voucher, setting it to 'multiple codes' rather than 'shared code' and then generating however many codes you needed, however distributing a unique code to each recipient would probably be fiddly. Now there's an easy way. Put the $VOUCHERCODE$ 'merge field' somewhere in the email. This will be replaced with a new, live, unique voucher code, unique for each recipient. Choose to whom it should be sent (e.g. entrants of your event, or everyone on a particular mailing list, or both), and click 'send'. We will generate one code per email recipient, and insert that into the email we send them, replacing your $VOUCHERCODE$ text. 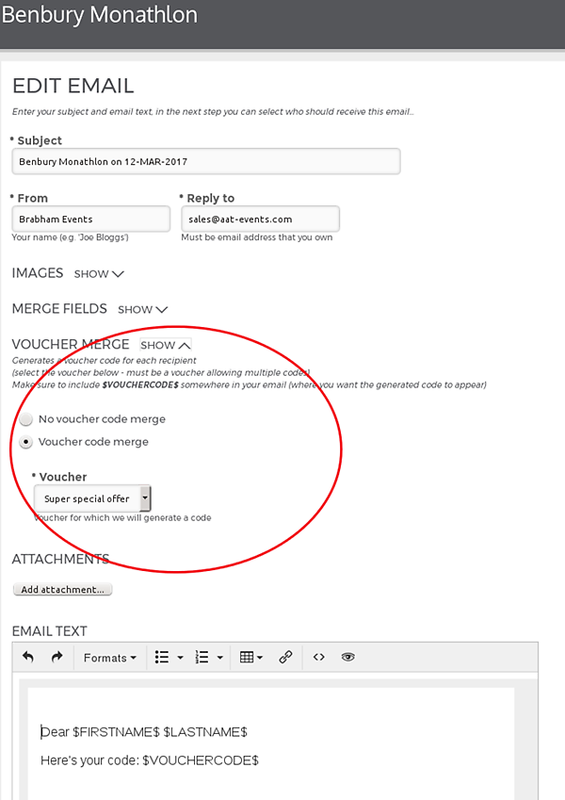 You can use voucher merge with event emails, or group emails, or even 'automated emails' (you could automatically generate a voucher code in you entry confirmation email, for example).